Today, London bids farewell to ‘Dippy’ the Diplodocus. After 111 years on display at the Natural History Museum, Dippy will embark on a tour around the United Kingdom. Dippy is a cast of the famous Diplodocus carnegii. The original skeleton of the titanic creature was discovered in Wyoming in 1898. The excavation was funded by Andrew Carnegie who was determined to bring the largest creature to ever walk the earth to his beloved Pittsburgh. His headline-making creature stretched to almost 85 feet long and stands today in Pittsburgh’s Carnegie Museum of Natural History. In 1905, a cast of the skeleton arrived in London (more on that in a few month’s time). 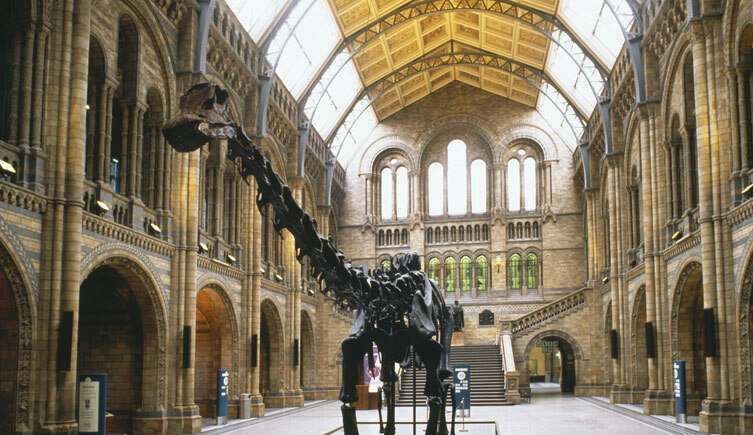 In 1979, Dippy took center stage in the Museum’s central hall where it has remained ever since. In 2015, the museum announced Dippy would concede his position in the museum’s entryway for the skeleton of a blue whale, highlighting the importance of conserving modern species in difficult times. This decision sparked controversy and a ‘Save Dippy’ campaign. Ultimately, the museum has stuck by its decision, but Dippy will tour the UK and gain exposure among many who would not have seen the skeleton otherwise. Share your pictures with ‘Dippy’ or your favorite Diplodocus on social media using the hashtag #TDIDinos !